I could not teach my dogs any obedience. They were so wild that I had to shout with them all day long. Angie came - and they obeyed her immediately. No screaming, no yelling or noise anymore. Now I have two wonderful dogs beside me. 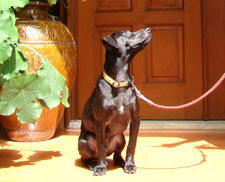 Angie is the trainer all dog owners in Asia should contact for training their dogs. 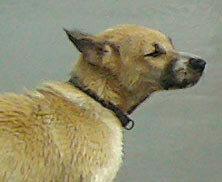 She is just gifted in dealing and handling dogs, especially difficult dogs. My dog was attacking kids! Angie could stop him, today he is a calm, relaxed dog. I encourage all dog owners to attend her courses or workshops, Angie is a five star dog trainer and behaviorist. I am happy to tell you that after one(!) training session with Angie my dog stopped pulling the leash. He immediately started to walk proper on heel after about 10 minutes training. I could not believe it. Thank you Angie! Angie accomplished what other trainers could not do. 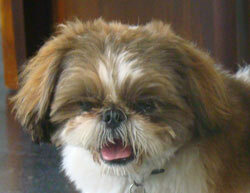 She solved the house-training-issue with our Shih Tzu Kessy, who peed everywhere inside our house. We are all really happy. Thank you Angie for your knowledge, patience, and help with our dog. I am so happy to train my dogs together with Angie. Without question, she has caused an enormous effect by teaching ME about my dogs; who they are, and how to approach them. Best of all: My two dogs love her! Even after four years, I still do randomly training with Angie, we all enjoy the lessons.